That really is the question, when you don’t have all the shows on your doorstep. Going to see London shows, for me, isn’t just the matter of a cost of a ticket – it’s the travel, hotel and cost of meals whilst there. Perhaps this is partly my fault for wanting good seats (my favourite seats are in the stalls, about 5 or 6 rows back, centre of the row – very expensive). But if I’m going to spend all that money on the overall trip, I want to have a good viewing position. The shows that are only there for a short run have to be top of the list otherwise I’ll miss them. Next will be the shows I’m really excited to see, but seem to be quite settled in their homes and don’t look like they’re going anywhere anytime soon. Shows that are getting rave reviews and have a bit of a buzz about them, but aren’t one’s that I feel a massive urge to see . About the last factor - when I do go to see these shows, I’m more often than not completely blown away – for example, Lord of the Rings, which I ended up going back later that month to see (at the time I was living in Croydon and it was much easier to go). It’s just a shame I rarely get to these ones. If the show is touring and it’s coming near me, I’ll probably go and see that version instead, although I’m aware I’m getting a watered down tourable version, such as Legally Blonde later this year. If I answered this poll, I would have probably said ‘No, I would be too self conscious’. Hopefully, this year, I’ll get over that. I even think that once I do it, I'll prefer it because I often end up worrying that the person I've taken to see the show isn't enjoying it, which spoils my own enjoyment. 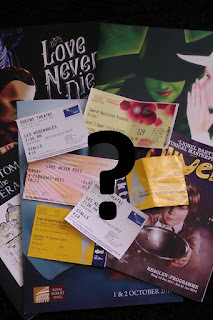 After I’ve made the decisions about the West End shows, there’s also the decision about what local shows to see, to fill the gap in between. I’ve posted before about the different qualities of amateur dramatics. There are some real hidden gems out there. But for every amateur company which shines, there are a handful of duds. These are often full of casts who have no propensity for acting and are doing it as a hobby. This is fine, I have no problem with people trying, just don’t charge audiences £10 for the privilege of watching them try. The other problem with choosing local shows to watch is finding the venue! – in London all the theatres are lumped together, very efficiently, in theatre land. In the instances when it’s not in theatre land – it’ll be in a very accessible position at the end of a short tube journey. I had an incident a week or two ago where I was going to a venue outside of the centre of Swansea. I hadn’t been there before and despite living in Swansea for most of my life, I don’t know my way around here very well. I typed the post code into google maps and was given a location. I felt happy I could get to this. Unfortunately, it turned out this wasn’t where the venue was at all, and I was lost. I had no idea where it actually was and ended up missing the show. I love seeing shows and there’s no way I would let all the above put me off enjoying something that I have loved my entire life. It would just be so much easier if I didn’t live the wrong side of the M4. To see or not see? With all these things to think about, it’s not such an easy question, after all. If you didn’t see it, because you were actually there enjoying the live performances that those of us watching online weren’t privy too, I’m sure you’ve already heard about it. Yes, perhaps he was slightly intoxicated but for a renowned theatre critic who writes for whatsonstage.com themselves to not be able to pull his thoughts together at an awards ceremony for the very industry he critiques is very embarrassing and was horribly cringeworthy to watch. I wanted to be able to post a link to a clip, for those of you who missed, but rather unsurprisingly there was nothing to be found. That aside, I found the whole evening a bit disappointing, which seemed to be the general consensus from fellow tweeters. I suppose the problem of having the awards voted for by the theatre goers themselves is that, having not seen all the nominees, most votes go to the popular ones that everyone is familiar with ... hence the reason I don’t vote in these awards – I feel it’s only fair to vote if you can give a well thought out, reasoned, balanced vote having been to see all the nominees... or at least a good proportion of them. Unfortunately, I can’t get to London often enough for that to be the case. I think this bias towards the more “popular” nominees was demonstrated in the results. 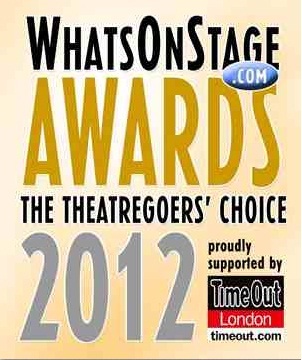 Especially when you consider that Amanda Holden won the award for Best Actress in a Musical. I haven’t actually seen any of the actresses nominated, but I have heard so much better things about Caissie Levy, for instance and twittersphere seemed to agree that the Matilda girls should have won it. Again, there was outrage on twitter when the Theatre Event of the Year award was given to the reunion of Catherine Tate and David Tennant. This is not an event, the people cried. It seems so unfair that it went to this rather than the Phantom 25th Anniversary, or at the very least, Michael Sheen’s Port Talbot based ‘Passion’ play – both of these being actual events, rather than clever casting decisions. Maybe this award needs better guidelines as to what constitutes an event. Another perplexing aspect to the evening seemed to me the decision to employ Alan Davies as a host. Did this decision happen after asking Sheridan Smith to host because of their connection through Jonathan Creek? At first, his between awards banter was very funny, it has to be said. But as the evening wore on (perhaps again to a slight inebriation) it got slightly irritating and repetitive. The Benedict Cumberbatch joke definitely got to a point where you could hear the slightly awkward laughter of a Sheridan trying to politely move it along. And his excitement at getting to the last few prompt pages of the awards evening was more than just a joke, it seemed. Something tells me he didn’t particularly want to be part of this evening at all. There were some well received winners though such as 'One Man, Two Govnors', for best new comedy and 'Sweeney Todd' for Best Regional Production. The most notable and well celebrated winner being 'Matilda the Musical', which looked as though it wasn’t going to get its recognition until the end of the evening, where the show swept up Best Choreographer (Peter Darling), Best Newcomer (Tim Minchin), Best Set Designer (Rob Howell) and – the icing on the cake – Best New Musical (and looking at the statistics it won quite comfortably). I was pleased that those of us who couldn’t attend the ceremony got to share the experience online, even if we had to miss out on the performances – but then, if we had been allowed that privilege we may have missed out on that wonderful interview with Michael Coveney. I can’t begin to review this performance without first acknowledging that Ramin Karimloo was scheduled to be Jean Valjean on this evening but had to pull out due to sickness. Like many people in the audience, I had chosen to see les mis on this occasion over all the other shows primarily to see him in this role. And I’m not going to lie, I was crushingly disappointed. That being said, it is the nature of live, long running theatre that you can never guarantee what performer you will see. Everyone gets sick now and again, especially when pushing themselves hard, as Ramin has been. Would you go into work if you were sick? Let this be a reminder that when you book to see a show, you are doing just that – booking to see the show, not the performer. Robert Vickers was the understudy on this occasion and it cannot have been easy performing to an audience full of disappointed people expecting to see Ramin. It was obvious that he was giving the performance everything he had, I don’t think he could have tried harder. The only problem was his voice just wasn’t strong enough, struggling to hold the crucial note at the end of ‘2,4,6,0,1’ in ‘Who am I’ and again during the dying scene. With the latter he tried to cover it up by turning it into the pain the character would have been feeling, which was entirely plausible, but it was still a definite glitch. There was also a moment, where he must have picked up the chair in the wrong way after the confrontation scene and it fell apart in his hands. It must be noted that Robert Vickers is the 2nd cover and possibly not well rehearsed and much less familiar with the part than even Christopher Jacobsen (1st cover) would have been. There was someone at the front of the auditorium who was showing a lot of encouragement for him with much cheering after the big numbers and I’m pleased that he had this support. It’s just unfortunate that some less forgiving theatre goers around me wouldn’t put aside their disappointment to appreciate what they did have. And what we did have was an otherwise brilliant cast. There were 2 other understudies performing on this evening and they were two that I’d actually been hoping to see over the main ones - Fra Fee as Marius and Scott Garnham as Enjolras. I’ve been aware of them for a while and heard only good things and they didn’t disappoint. The female leads were technically very good, even if I wasn’t blown away. Alexia Khadime as Eponine has a strong voice but at times it got a little too nasally for my liking. Perhaps I was always going to be harsh in my opinion of Eponine, though, as Samantha Barks was perfect in that role to me. I have to give mention to Katy Secombe (who, I later found out, is the daughter of Harry Secombe) and Cameron Blakely as the comic relief in the form of the Thénardiers. I particularly loved the part during the beggars banquet where Thénardier spins her right off into the wings, literally stopping the show as if it were a mistake – nice touch. 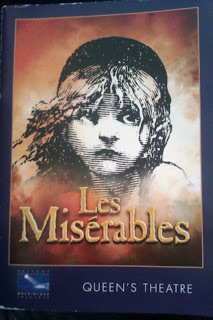 For me, the absolute standout performance goes to Hadley Fraser as Javert. There is something reminiscent of Philip Quast’s Javert in his sneering portrayal and he has this presence that is essential for the character – an oppressing authority with unwavering conviction in what he believes is good & bad. Hadley is well matched to this role, much more than he was to the role of Raoul for Phantom 25. 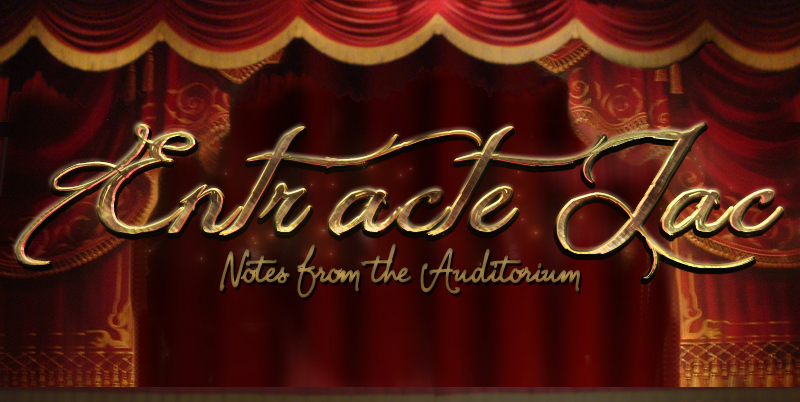 A note to the director, though – can’t something be done about Javert’s exit after his suicide? The rolling off stage always makes me laugh in a moment which is supposed to be sombre and I heard someone behind me chuckling too. It is a bit of a moment killer. I also want to give some recognition to James Charlton, a swing filling in one of the student roles. There was something magnetic about him, that stage presence which pulls ones attention and he has this. I particularly liked an interjection he made after Grantaire sings ‘I’ve never seen him ooo and ahh’ after which he pitches in with ‘Oh, this time you’ve gone too far, Grantaire’. I don’t know if that’s always in it and I’ve just never heard it so clearly or if he adlibbed it. Whichever way, it made me smile. I really noticed the use of cold, uplighting during this performance highlighting the more sinister turns – for example the latter half of ‘lovely ladies’ where it turns from being a fairly light-hearted look at the life to which these women have resigned themselves to the nightmarish reality – an atmosphere created purely by a small change in lighting state creating looming shadows against the grey wall behind them. The same technique is used for the transition from the wedding chorale to beggars at the feast where the Thénardiers take over the scene and it’s transformed into something distorted. So, Ramin may not have been in it, but it’s still an amazing show and a captivating, heart wrenching story put together into this phenomenon that has seen many performers come and go. A production that is worth booking whether there’s a well known performer or not. I’m not saying there weren’t times I was wondering how Ramin would have sung certain parts or how he would have portrayed the character, but that wasn’t how it worked out and sometimes you just have to except that, move on and enjoy the show and the cast you are presented with. You may even discover someone new.